Chromium is an open source project (from Google) to create a browser for different platforms. Among other things the browser Chrome is based on it. The Chromium Embedded Framework (CEF) is an open source framework for embedding Chromium into user applications. It can be used on Linux, Mac OS X and Windows in 32 and 64 bit versions. Originally there were two versions of CEF, CEF1 and CEF3, but CEF1 is no longer maintained. CEF can be used in Delphi via the Delphi Chromium Embedded Framework (DCEF3). 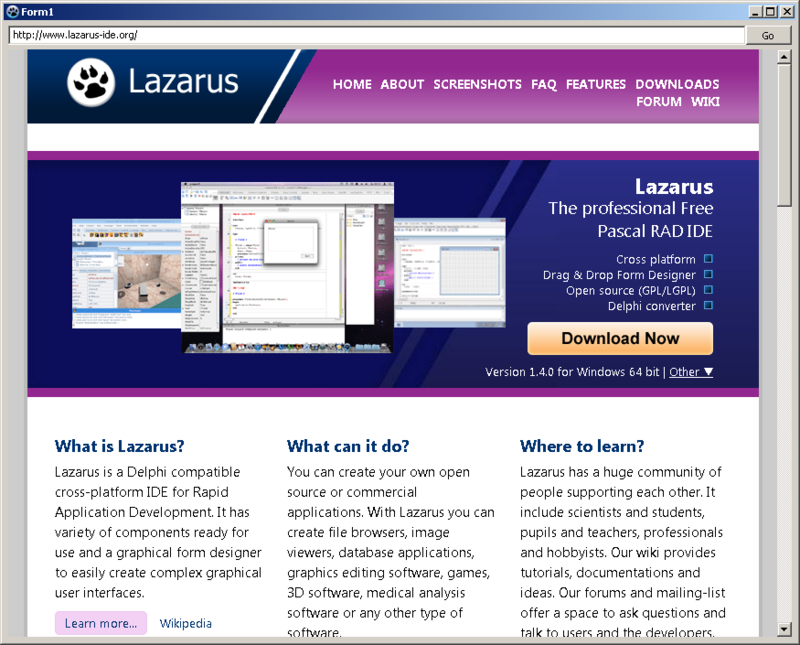 For Lazarus/FreePascal there is the equivalent framework fpCEF3 (or alternative CEF4Delphi with examples for Lazarus including newest versions of Chromium Embedded Framework). A minimal example with a simple browser is created. The CEF libraries are needed for loading, so it makes sense to create a new project folder, to save the project and the libraries in it together. The files (libcef.dll, natives_blob.bin, icudtl.dat etc.) are in the same directory as the project and the directory locales in C:\SimpleBrowser\locales. If your program doesn't start, maybe a Antivirus program prevent this. If your program start but your TChromium window keeps empty, maybe a firewall block it (see Chromium Embedded Framework for Free Pascal (fpCEF3) BRUNCH 2556). If your file structure isn't correct (see Minimal example) and therefore some libraries wouldn't be found, you can get optical errors (see Fpcef red borders in the browser). This page was last modified on 10 March 2019, at 06:50. This page has been accessed 26,713 times.